Estampe has online savings on auto dealer flags and pennants used for automotive sales lot advertising. Take advantage of automotive marketing products such as dealer flags and pennants to convey to your customers that something special is happening at your car dealership. Estampe has a wide selection of point-of-sale materials and sale flag banners for automotive event marketing. Remember, auto dealer flags and pennants help motivate not just your customers ... but your salespeople too! These top quality manufacturer specific Car Window Clip On Flags are designed to promote the sale of vehicles without antennas. They quickly and easily attach to any car or truck side window using a plastic molded clip and come completely assembled. That is why they are used by almost every professional automotive sales lot. Each of these clip-on flags are high-quality, durable, have vibrant colors, and are long lasting. These top quality Auto Window Clip-On Flags are specifically designed to promote the sale of vehicles without antennas. Because they quickly and easily attach to any car or truck side window using a plastic molded clip and come completely assembled. That is why they are used by almost every professional automotive sales lot. 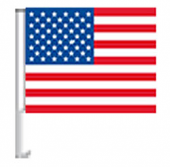 Each of these clip-on flags are high-quality, durable, have vibrant colors, and are long lasting. These Car Window Clip-On Paddle Flags are printed on both sides for maximum visibility. They are also mounted on a pivoting pole, which allows the flag to turn into the wind. 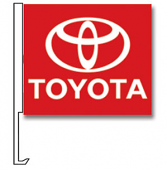 This feature allows these flags to last longer on your dealership sales lot, making them more economical in the long-run. Intended to promote and advertise cars with no antenna or vehicles that have retractable antennas. These Vehicle Antenna Flags easily slide over a car's antenna and are manufactured with 32" sewn on sleeves making them easy to install and remove. We offer three types - plasticloth, metallic, and supreme cloth. These American Flag Pennants are perfect for use on your auto dealership's sales lot during patriotic holidays like Memorial Day and Fourth of July. Choose between Polyethylene and high quality Supreme Cloth pennant string banners. Both are durable and reusable. These Metallic Streamers will attract attention and add color to your dealership car sales lot displays by glittering and fluttering brilliantly in the wind. They are durable and weather resistant. Not only do we carry these metallic streamers, but also be sure to see our triangle and American flag pennants. These high quality Triangle Pennant Streamers attract attention and add color to any car lot. They are durable and weather resistant. These patriotic In-Ground Pennants are six feet tall and mounted on strong fiberglass poles allowing the pennants to bounce and glitter in a slight breeze without breaking in strong wind. They come in two styles: plasticloth or metallic. These Auto Dealership Message Flags are manufactured using top quality nylon and a heavy canvas header for a long life outdoors on your auto sales lot. The red, white and blue patriotic design give them year round make versatility.